Air bazooka, invented by Brian Walker, is a tube with a flexible plastic cover on one end, named for its appearance after the bazooka. 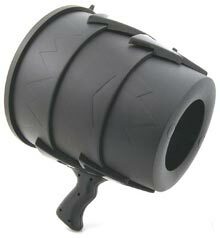 Airzooka is the air bazooka ‘fun gun’ that blows a massive amount though harmless ball of air towards any object, person or even animal that the air gun pointed to. Airzooka is effective up to thirty feet and beyond, and it operates without batteries or electricity. And you no need to worry about ammunition, or running cost, as the air gun, as implied, use just the free air to shoot.